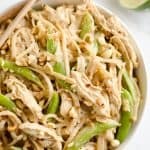 Pressure Cooker Thai Peanut Chicken & Noodles is the best 30 minute Pressure Cooker recipe you will make! 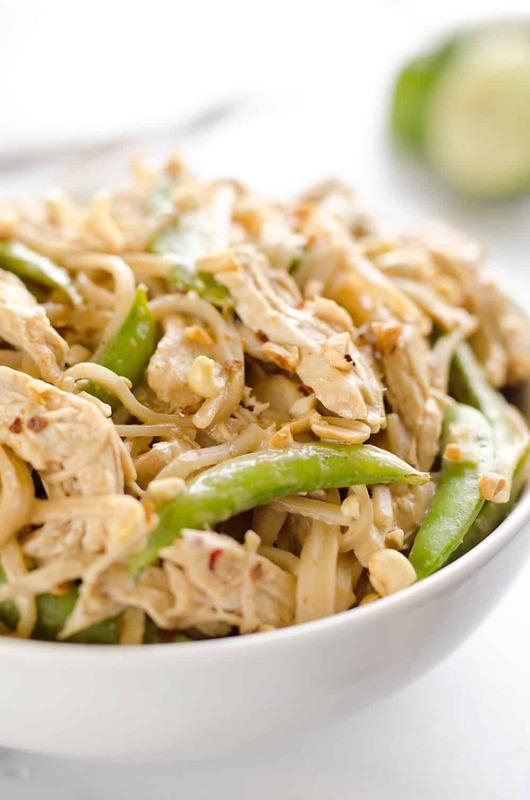 Lean chicken breasts are cooked in a homemade spicy Thai peanut sauce and finished off with rice noodles and peas for an easy and healthy one-pot meal made in your Instant Pot. I’m not going to lie, I am quite proud of this recipe! It is so good on so many levels. The idea came to me after using my Instant Pot for a bit realizing that the extra liquid was always boiling after cooking the meat. I put that together with the fact that rice noodles are cooked by letting them set in boiling water as opposed to how traditional noodles are boiled. 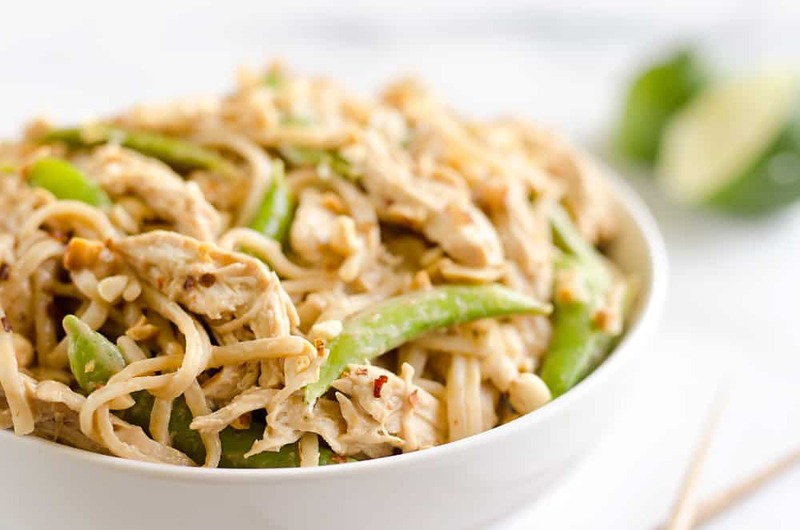 That resulted in this Pressure Cooker Thai Peanut Chicken & Noodles recipe where you cook the chicken in a thai peanut sauce, open your electric pressure cooker to add the noodles and peas and then cover it back up and leave it on the slow cooker mode. 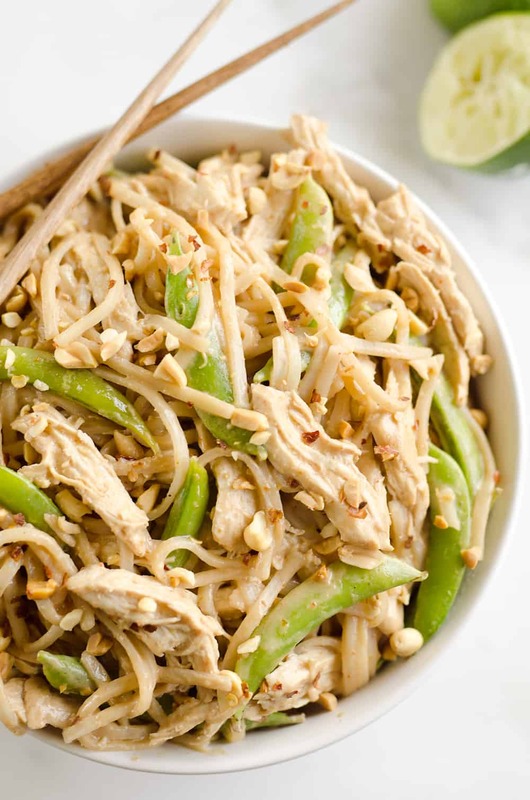 The end result is the most tender and flavorful chicken with a rich Thai peanut sauce with just enough noodles for a healthy and semi low-carb recipe. The peanuts and peas are optional, but they add a nice crunch and color to the otherwise brown dish. This wholesome meal is something that you will not only feel good about eating, but you will keep coming back for more, because it tastes so good! While I love making simple roasts or chicken in my Instant Pot, it is fun and challenging for me to come up with complete one-pot meal. Whether I am cooking up Pressure Cooker Turkey Verde & Rice or this Pressure Cooker Thai Peanut Chicken & Noodles, the electric pressure cooker is hard to beat in the convenience it provides as well as the tender fall apart meat it produces! 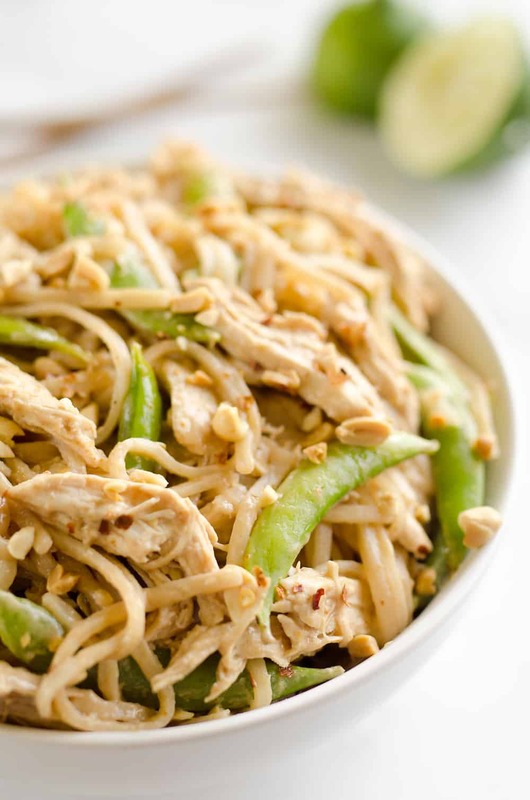 Pressure Cooker Thai Peanut Chicken & Noodles is the best Pressure Cooker recipe you will make! 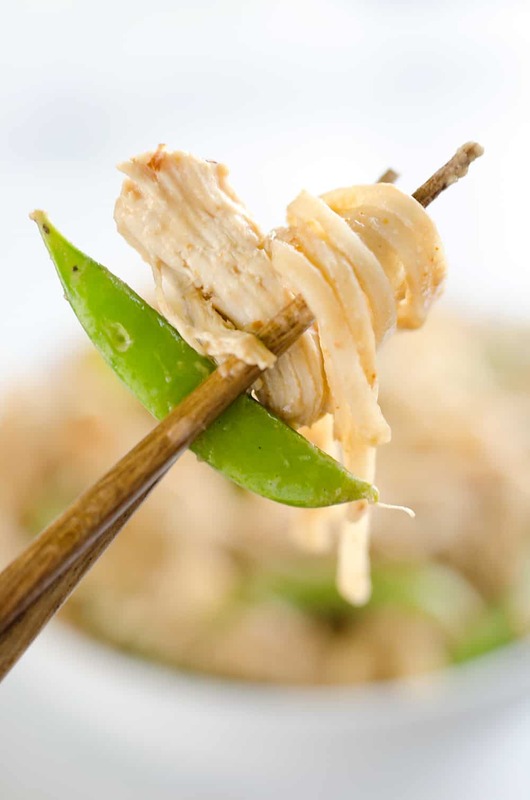 Lean chicken breasts are cooked in a homemade spicy Thai peanut sauce and finished off with rice noodles and peas for an easy and healthy one-pot meal made in your Instant Pot. Turn your electric pressure cooker to saute and lightly saute the peas for 1-2 until just slightly cooked. Remove peas and set aside. Turn off of saute. Add the chicken, Thai peanut sauce and broth to the pot. Cook on high pressure for 12 minutes. Release the steam by turning the nozzle and remove the chicken from pot, leaving the sauce. To the sauce, add the noodles and ensure all of the dry noodles are submerged in sauce. Top with the peas and replace the cover as quickly as possible. Change the settings to slow cooker (normal), and cook for 10 minutes or until the noodles are soft but firm. Meanwhile, shred the chicken breasts and set aside. Remove the lid of the pressure cooker and give the noodles a good stir. Add the chicken back to the pot with the noodles. Cook on slow cooker mode for an additional 10 minutes. Serve warm. 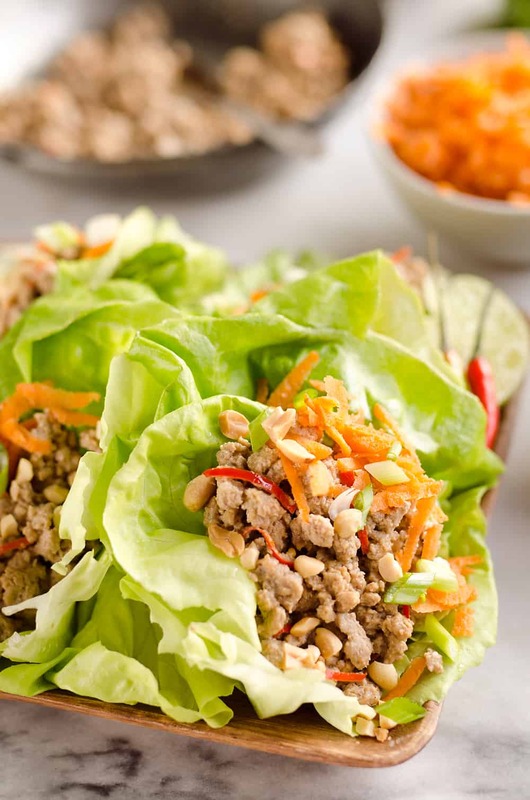 More delicious Thai Peanut recipes! You, my friend, are a genius. This is amazing. I need to do an Instant Pot version of my garlic chicken rice noodles! Thanks Nicole! I am dreaming up so many recipes that I could use rice noodles with in my pressure cooker. It really doesn’t get much easier. 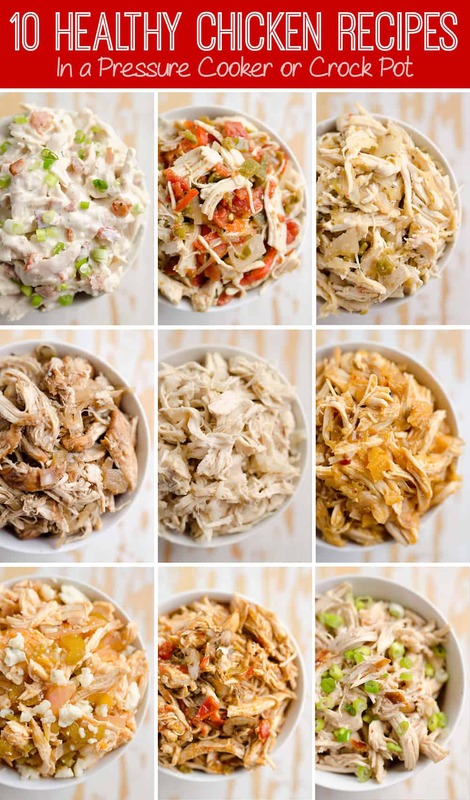 So Nicole Johnson … have you created this IP recipe with Garlic Chicken Rice Noodles? Would stir fry noodles just be like rice noodles? Yes, rice noodles are what you would want to use! Though the flavor is good, the this felt like it needed twice the amount of sauce and another 8 minutes of pressure cooking as written. I made it exactly as written. I had to add more broth each time I opened it to keep it from scorching, ,the noodles overpowered the dish, and the peas weren’t cooked. Next time I will cut the noodles in 1/2, cook the 2nd time frame (after the beans are added) at pressure and add 1/2 to the sauce recipe. Thank you! Hi Shanna, I am happy to hear you enjoyed the flavors. As for the cooking time, I have made this on multiple occasions and these cooking times worked well for me. Perhaps its a different in electric pressure cookers or preference in noodle bite? Hope it works well for you next time with your adjustments! There are three different settings for the Instant pot slow cooker option. Are you using “normal”? Me too. This is the only Instant Pot fail I’ve ever had. The sauce scorched to the bottom of my pot, so I dumped what was left into my second pot, had to make another batch of sauce, and then did the noodles, which took 20 minutes instead of ten. I think I probably salvaged it, but that was stressful as all get out. Having said that, the sauce is good enough to drink straight out of the blender, so I will totally be making that part of it again! 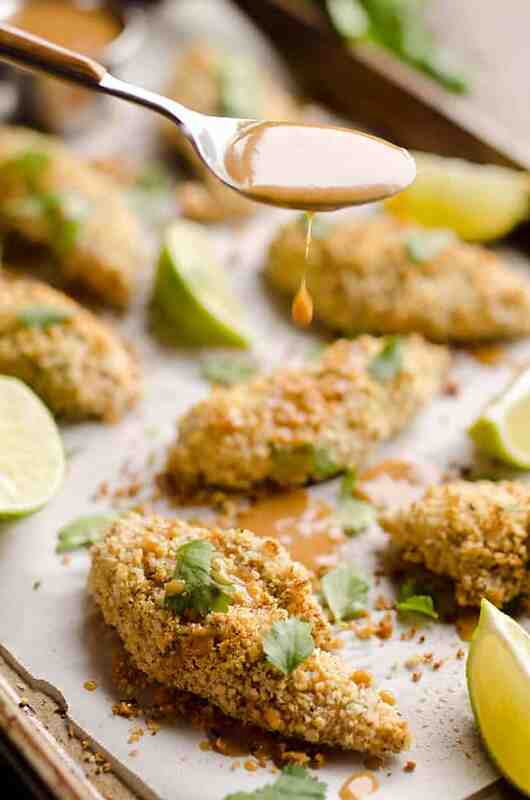 Do you think this would work using canned tuna instead of chicken? I think it would have an entirely different flavor. I wouldn’t personally be a fan of the mixture, but if you like tuna with Thai Peanut sauce I would recommend just adding it before the last 10 minutes in slow cooking mode. Frozen chicken breasts would work great, just cook them for 13 minutes instead of 8! I have been planning to make this recipe for weeks but it wasn’t as easy as detailed above. I made it word for word but I had some issues. The chicken was tough after only 8 minutes under high pressure and difficult to shred. I put the rice noodles into the remaining liquid in the instant pot but it didn’t even come close to covering them, so I wound up adding more thai peanut sauce and broth, then cooking the noodles and peas under high pressure for an additional 2 minutes. The noodles were scorched on the bottom of the pot. I added the shredded chicken back to the noodles and the mixture was dry–nowhere near enough sauce. I added the rest of the thai peanut sauce I’d made, plus more broth, and placed it on slow cooker mode for 10 minutes. In the end, the texture was pretty near pad thai and the chicken was cooked fairly well. The flavor was good but it was too spicy for my kids, even though I added less red pepper flakes than the recipe called for, and even though I like spicy dishes, the heat in the sauce kind of overpowered the peanut flavor. All in all I do think I would make this recipe again, just knowing it’s going to take a few more steps than the recipe requires. I thought this was delicious. I might cook the chicken for 2-3 minutes longer, as it didn’t shred as easily as I would have liked. But I’ll definitely make this again. Do you think this could be done with frozen edamame in place of the peas? Should I defrost the peas first before adding to the dish? Thanks. YES! I think that would be a great swap. If you add them frozen, I would put it under pressure for 1 minute to cook the edamame. At the beginning cook the edamame on their own for 1 min, then follow the rest of the instructions? Sorry I didn’t clarify better. I would actually add the edamame after the chicken cooks and add 1 minute pressure for the chicken and edamame together. OMG, this was so very delicious! My husband and I devoured it, and I will make this again! I will add a little more sauce next time (the sauce is SO delicious) and will include some chopped dry-roasted peanuts as a garnish. A winning recipe! Happy to hear you loved it Allyn! I agree the sauce is one of my favorites. I had 2lbs of chicken, so adjusted the quantities accordingly (with extra since some people reported dry noodles) – my liquids were double (2c of sauce, 1.5c of broth), and the noodles were 8oz. At the end of cooking, all the liquid had been absorbed, and the noodles were perfectly cooked. But do know that this is not a saucy pasta dish – all the flavor sticks to the noodles and chicken. My husband actually added a dollop of the peanut sauce to his dish as he likes it saucier. I didn’t change the cooking time, and my chicken was still perfectly shreddable after 12 minutes. 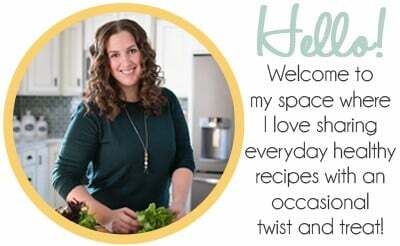 Great Instant Pot recipe – easy to make with pretty much zero hassle! Thanks! Happy to hear it worked great doubling it for you! I found that you need more liquid than just the broth and sauce called for. I had to add about 2 cups of water additional. If you were to add tofu (extra firm) or red bell pepper, at what point would that be done? Made it the first time, with double sauce and extra noodles and added bean sprouts. It was very good, but I think I’d like to try it with tofu and peppers…. I have honestly never cooked tofu, so I’m not very familiar with it. From what I understand from tofu, you want to get a good sear on it, so I would saute it in the IP in some oil first and then remove it. Cook the dish according to the instructions, adding in the bell peppers with the noodles, then stir in the seared tofu at the end with the peas. this has become one of my favorite go-to dinners! the rice noodles i use call for being soaked in warm water before adding to a dish…..once i did that, everything came out of the IP just perfect. Are the nutritional counts available? You can quickly get all the nutritional info by plugging it into My Fitness Pal! I made this tonight without using the instant pot. I got scared off a little bit by some of the negative comments, but I had told my boyfriend I was making Thai peanut chicken and felt like I needed to follow through. So I decided that I would use your recipe but stir fry it in a pan with shredded chicken I already had in the fridge. I hate to be that person who leaves a review on a recipe that they completely changed. But it didn’t feel right to enjoy this as much as I did without telling you. I kept all the ingredients the same and just cooked it by more traditional methods. We really loved it and will be having it again soon I’m sure! Thanks so much! I made this last night and it was super yum! I did find that I had to cook the chicken for 17 minutes rather than 12 minutes to get it cooked all the way through. Also the chicken to noodle ratio was way overwhelmed by the chicken so next time I would definitely either cut down on the chicken or add more noodles- or just omit the chicken altogether and make the noodles with just veggies. The sauce is also missing a little something and I think it might just need some lime zest for a bit more of a bite? Can’t wait to try this again. My instant pot only slow Cook’s for 30 minutes and up. Did you set it for 30 and then quick release at 10? You can just stop it at 10 minutes and won’t need to do a quick release. No pressure should be building during the slow cooker mode.